Evouna’s nickname for the time being may be The Sniper, but The Sniffer would also be apt. With three goals scored in qualifying, Evouna was Gabon’s top scorer. Everything the 22-year-old does is done in an eyelid’s blink, but, with the calculated habit of smelling where the weakness is in defence, he is more than a speed merchant. Unselfish with the capacity to change pace at unusual ease, he stations himself on the shoulder of the last defender or take advantage of a high line, even when giving his opponent the benefit of a head start. Though just 5’10”, there’s the powerful, battering-ram side to him too, where he can bully defenders into mistakes or force his way through several defenders with precise, coldblooded touches before finishing. Having a breather in defence whilst your team is on the attack? There’s his pick-pocketing demeanour for that. Always planted in the opposition half even when everyone is back to defend a corner, his fantastic counter-attacking alliance, and general understanding, with Aubameyang is as good as any you’ll find at the tournament. The technical aspect of Evouna’s game is yet to mature and this can make his finishing hit-and-miss, but he is definitely one of Gabon’s key men. Hidden and blossoming in Morocco with Wydad Casablanca, he is, for now and for many, a Rumsfeldian unknown unknown. The 28-year-old was in the provisional list for Afcon 2012 but was spectacularly dropped from the full squad and, it’s safe to say, for as long as Herve Renard was in charge, it was a Given that he could not get over the emotional trauma of missing out on triumph. Retreating into a self-imposed exile for over two years, Singuluma has been a linchpin for TP Mazembe. “If Mazembe is winning and surviving it is because of Given,” Katumbi once rhapsodised. Twinkle-toed, hardworking, with an eerie knack for perfectly timed, Lampard-like late runs into the box and crucial goals, Singuluma’s energy has, for all their goal-shyness, added more synergy into the Chipolopolo attack. Having won the African Champions League twice and the Congolese league four times with TP Mazembe, Singuluma feels accomplished and has pledged to use the tournament as an audition for a new club. When South African giants Kaizer Chiefs headed to the Tata Raphael Stadium in Kinashasa to face AS Vita Club in the first round of the African Champions League, they didn’t foresee a riot. In Firmin Ndombe Mubele, the recently crowned Africa-based Africa Footballer of the Year, they would encounter a 20-year-old with remorseless insatiability, and he would score an explosive hat-trick as AS Vita Club won 3-0. That win would serve as the self-belief ignition for the Congolese club to go on a run to the final of Africa’s premier competition, and Mubele would go on to be one of the stars of 2014, finishing joint stop scorer in the competition with 6 goals. Possessing flat-out pace and quickness of thought and feet, he has the lofty duo of Jeremy Bokila, top scorer for DR Congo in qualifying, and the fit-again Dieumerci Mbokani to jostle with for the single-striker role in the Leopard’s system, so he will probably be third in the pecking order. But his coach Florent Ibenge, who is also his manager at club level, knows all about his merits and is not merely taking Mubele to the tournament for a shadowing trip. Algeria’s best offensive player during the AFCON qualifiers wasn’t talismanic winger Sofiane Feghouli, celebrated magician Yacine Brahimi, or lone striker Islam Slimani. With 2 goals and 4 assists in 6 matches, Riyad Mahrez captivated the Algerian public who scarcely knew him. Though he has found form in the Premier League these last few weeks, British fans are yet to see the very best of Riyad Mahrez. The Leicester City winger is a different animal with Algeria where his defensive responsibilities aren’t as restricting, and he is permitted to roam freely in attack. Congo have taken on a new dimension in attack and Claude LeRoy owes much of that to the strike partnership of Thievy Bifouma and Ferebory Dore. The former is a quick, direct player willing to run at defences. Doré is much more of an aesthete’s striker. Standing at an imposing six-foot-four-inches, Dore has no right possessing the velvet ball control he does. In Sudan, on the sixth and final matchday of qualifiers, in a match Congo had to win to progress, Doré was sublime. He calmly collected any ball knocked up to him, using his deft touch to juggle over the heads of ridiculed defenders with sombrero upon sombrero. The odds are stacked against Congo in Group A, but with Dore and Bifouma in attack, Congo can believe in their chances. Despite scoring 20 goals in 75 appearances during the incipient stages of his career in Ardennes, parent club Lille sent Abdoulaye Diaby on loan to Mouscron in Belgium for futher development. In an ironic twist, Diaby is now the Jupiler League’s top scorer with 12 goals, and Lille are struggling to find viable options in attack. Les Dogues have recalled the exciting dynamo, who can play anywhere in attack. But before he returns to Northern France, Diaby will mark a detour through Equatorial Guinea where he will add bite to a banal Malian attack in Group D.
After a quick start to his career, Ryan Mendes’ career has stagnated. Now 25 years of age, the Cape Verdean pearl has taken on the unfortunate tag of ‘perennial prospect’. Nagging knee and ankle injuries have resulted in an increase in weight and have lessened the explosiveness and clever dribbling he once displayed at Le Havre and then Lille. Nevertheless the striker with a prestigious pedigree, is still the biggest name the Blue Sharks boast, and he has retained his calm finishing. The Afcon may be the perfect springboard for the curly-haired perennial prospect to finally blossom as a key player. A relative minority within the South Africa squad due to his northern hemisphere domestic career, Shakes Mashaba clearly feels it is worth relaxing his domestic player bias to include the 24­ year-­old Tokelo Rantie, as the Bournemoth striker’s goals powered them through qualifying to reach Equatorial Guinea. 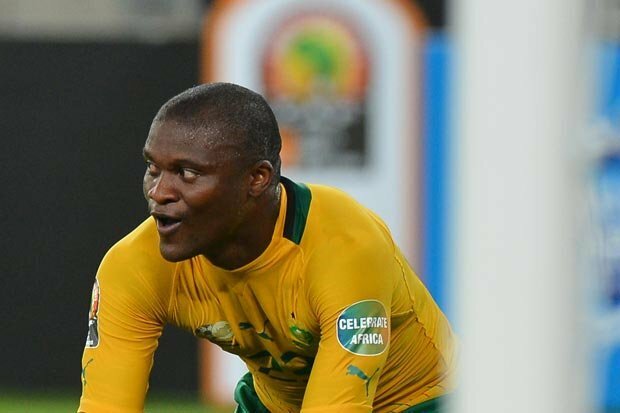 Remaining unbeaten in Group A, Rantie’s four goals in six appearances, contrbuting an impressive 40% of the total number of times Bafana managed to hit the back of the net – including two goals in the final match against Nigeria to send the Super Eagles packing. Despite injury and competition for places resulting in his game time for Bournemouth being has been restricted to substitute appearances, Rantie will no doubt get on the scoresheet at some point for his country, with his tireless dribbling bound to give the opposition hell – particularly if the pitch begins to cut up and defenders tire. Guinea’s secret weapon during qualifying, Seydouba Soumah seemingly came out of nowhere to propel his country to an unlikely place in Malabo. Having spent the last couple of years in Slovakia, playing for FC Nitra and then Slovan Bratislava, his relatively uninspiring scoring record for both club and country was turned on its head in qualifying, as he hit five goals in six matches. His diminutive size means he has often been used as an attacking midfielder domestically, but flanked by the creative talents of Ibrahima Traore and Idrissa Sylla, Soumah turned into a superstar. Skillful and unrelenting, he proved just how lethal he can be in front of goal, and more than made up for the absence of Lass Bangoura for Guinea. Likely to be looked to so secure an improbably place in the knockout stage, Soumah has less than 10 caps for his country, and how the 23­ year-­old copes on the continental big stage will go a long way to determining his success with his national team. A totem of the contagious brilliance that was the Burkina Faso side at the last African Cup of Nations in 2013, the wonderfully bizarre footballer that is Aristide Bance will be worth watching for reasons that are probably more due to his presence than his ability as a footballer. Flitting about Europe’s mediocre clubs, not playing and not scoring goals, Bance somehow managed to find himself in the Europa League this year after a summer move to HJK Helsinki – where he also hasn’t really scored. But when he pulls on the Burkina Faso shirt he comes alive. Leading the attack, his clumsy technique and lack of apparent talent for some reason makes no difference, popping up with a number of important goals – most notably a Panenka in the semi­final shootout against Ghana. Only managing a single goal in qualifying, this may perhaps be a hint that his powers are waning, and may lose his place to Alain Traore should the Lorient forward be fit. Awkward and languid, you won’t miss the 30­year­old when he’s on the pitch, with the traditional bleached blonde tarantula on his head making him a glowing beacon for The Stallions. If you’re feeling sad, just turn on the Burkina Faso game and watch Bance.